MEN'S VARSITY WOOL/ LEATHER SLEEVES JACKET RED W/ BLACK LEATHER SLEEVESFREE SHIPPING The jacket is crafted in a superior quality Wool Body and Top Quality Cowhide Leather or Sheep leather Sleeves.The polyester quilted lining, keeping you warm, even during the coldest days. Rib knit cuffs, Collar and Bottom of Jackets.One Internal and Two External Pockets. Specially treated leather allows for safe dry cleaning. Important Note: Using the table in the picture you can see what size best suits you. PLEASE MAKE SURE YOUR SIZE YOU WANT BEFORE PLACE YOUR ORDER. This Jacket is available in all sizes! We offer special sizes also.Available Colors are: White Leather Sleeves are available with different wool colors like Black, Red, Royal Blue, Navy Blue, Sky Blue, Green, Grey, Dark Grey, Camel and Maroon. Black Leather Sleeves are available with different wool colors like Black, Red, Royal Blue, Navy Blue, Sky Blue, Green, Grey, Dark Grey, Camel and Maroon. Shipping: We ship to all US States Including HI, AK, PR, APO, DPO, FPO, and US P.O. Boxes Most Orders will ship within 24-72 business hours after payment is received. We do international shipping only via US shipping center. International shipment may take 2-6 weeks for delivery depending on your country's customs and postal system Import duties, taxes, and charges are not included in the item price or shipping cost. These charges are the buyer's responsibility. We are not responsible any charges or duties incurred in your country. Combine shipping/savings is available, please send a message and we will send you a combined invoice. Returns & Exchanges: If you are unhappy with the product for whatever reason, please contact US to arrange a return, exchange and refund. Original American style for individuals, teams, clubs and groups. World's largest selection of in-stock 'ready-to-ship' varsity letterman Jackets. Top quality melton wool body with real cowhide leather sleeves. Quilt lining with an inside pocket. This jacket also features an inside 3/4 zip out lining to make it easy to add your own lettering and patches. Unisex sizing fits men and women from sizes XXS to 6XL (tall sizes too). See our SIZE CHART next to the photo. 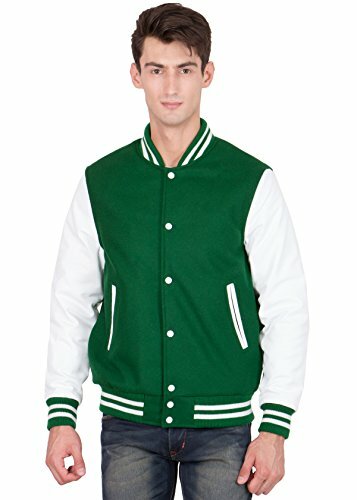 We have been making the finest Varsity Jackets and Letterman Jackets for over 20 years. FREE Shipping Continental USA. WE SHIP WORLDWIDE. If you have any questions about this product by Caliber Apparels, contact us by completing and submitting the form below. If you are looking for a specif part number, please include it with your message.